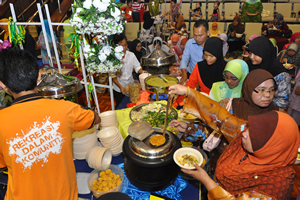 BANGI, 28 Aug 2012 – The National University of Malaysia’s (UKM) Hari Raya open house this morning was well attended by some of its staff and special guests including some of the original inhabitants of Bangi as well as orphans from the area. True to the Idil Fitri spirit it had enable the renewal of ties and forging of new ones especially with the international students who took the opportunity to be part of Malaysia’s open house spirit when celebrating its various festivals. Chairman of its Board of Directors, Prof Emeritus Dato’ Dr M Zawawi bin Ismail and Vice Chancellor, Prof Tan Sri Dato’ Wira Dr Sharifah Hapsah Syed Hasan Shahabudin were on hand to distribute zakat payments to those eligible and raya money to orphans from Darul Fuqaha Orphanage from Sungai Merab Bangi, orphans of UKM staff and children from schools around Bangi as well as single mothers to lighten their burden. 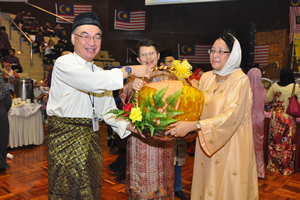 Hampers were also given out to staff of departments who had to remain at work on Hari Raya day. The university’s foster families from Kampung Kundang Ulu, Johore and Kampung Pulau Manis, Pahang and children of members of the Single Mothers Association of Bandar Baru Bangi (PITRAH) also attended. The event is part of the university effort to engage and build good and close rapport with the community. 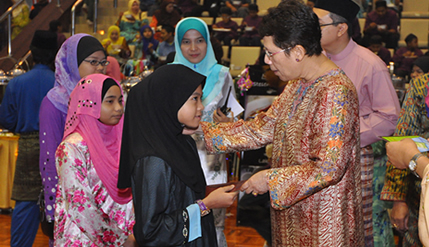 Apart from the spreads of the various Hari Raya dishes those attendimg were also entertained with performances by UKM staff and its Cultural Centre.